More is money! 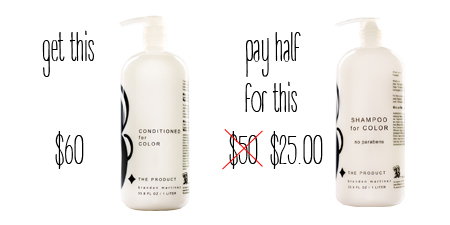 Get our 32oz Shampoo For Color for 50% off with the 32oz Conditioned For Color purchase. Add the 32oz Conditioned For Color to your cart and the Shampoo For Color will be offered for 50% off. This special is available only @btheproduct.com. What's so great about the Shampoo and Conditioned For Color? This is an everyday conditioner that Boosts blood circulation to the scalp and improves firmness and elasticity while fighting oxidation. Tocopherol Acetate: Promotes hair growth, prevents premature graying, stimulates blood flow on scalp, and repairs split ends.Canina Fruit Extract: Moisturizes the hair, adds density and volume, reduces dandruff, and conditions dry or damaged hair. Centella Asiatica Extract: Provides nutrients to hair follicles, prevents hair loss, reduces inflammation, and increases blood circulation to the scalp.